Services such as Account & Item Processing, Internet Banking, Bill Payment, and EFT/ATM services are crucial for community banks to successfully compete against the large banks. However, with these unfair contracts, the deck is stacked against smaller institutions. The ultimate effect of overlooked contract terms is often prohibitively expensive problems for franchises and shareholders during future routine corporate events and mergers. 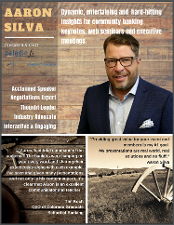 In this session, Aaron Silva will take the audience through 10 critical issues and negotiating secrets that bankers should know before they sit down at the negotiating table. Silva will discuss his latest proprietary research findings that outline the problems, pitfalls and best practices in restructuring vendor contracts based on nationwide intelligence. Through real life examples of how banks often pay in excess of $1 million more than necessary over the life of their core services contracts, the audience will learn how to dramatically improve their core and IT spending efficiency and better protect their institutions from downstream risks hidden within their contracts. for community financial institutions. An entrepreneur and industry veteran since 1991, Aaron founded Paladin fs, LLC in 2007 and launched Golden Contract Coalition in 2016. His invention of the Paladin Blue Book has leveled the playing field in contract negotiations vs. national Core & IT suppliers, gaining his clients more than $300M in cost reduction and $100M in merger value accretion. In 2018 Silva expanded Paladin to include the Fintech Advantage division, now addressing the anticipated adoption of fintech services within the industry. By the end of 2019, the GCC will have more than $1B in combined contract value - the largest banking association focused exclusively on developing a fair "Golden" contract standard that all Core, IT and Fintech suppliers will ultimately adopt in order to do business with this industry.